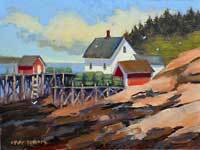 Mary Byrom lives on the southern seacoast of Maine within close reach of her favorite painting locations, the marshes and the rocky coast. A trained designer, illustrator, and painter she has an academic background in fine art. 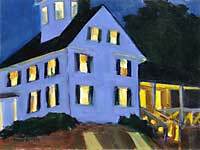 She paints from life with a focus on plein air landscape painting and is outdoors year round painting on location. Mary has received numerous awards for her paintings that are found in private collections around the world. She is a member of the American Impressionist Society and the North Shore Arts Assoc.